All transactions are safe and secure with a reliable history in online purchasing behind each of our associates. Buy the Survival Rule #3: Beware of Bathrooms t-shirt to own Zombieland clothing and merchandise. Columbus' Zombieland Survival Rule number three is Beware of Bathrooms. "When you're at your most vulnerable somehow they can just smell it." If you do find yourself in a bathroom-zombie scenario, learn from Jesse Eisenberg's mistakes. For example, toilet paper and cotton balls do not make good weapons, but shower curtains can be moderately useful. This Zombieland t-shirt is an amusing addition to any wardrobe. If you like this tee, check out the rest of the Zombie Survival Rules collection. 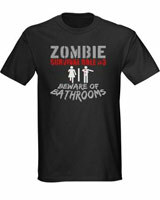 In addition to the Survival Rule #3: Beware of Bathrooms tee above, browse the Zombieland Clothing Gallery for more apparel like men's and women's clothes, kids shirts or hoodies.